There are a lot of things that politicians are judged for. From the way they dress to the way the direct the economy of the nation. But no one has ever wanted to rate politicians for the way they perform. Like artists on a stage. Even though politicians have a more boring dress code but yes like actors on a stage. Or in front of a camera. In reality that is what they are. And we even give them the stages and camera crews to perform for us. Did you know that sports betting has expanded you can also place your bets on no-athletic events such as political party, movies and many more to visit newzealandcasinos.co.nz to review best online casinos. Because essentially that is what they have to do in order to convince us to vote for them. And the human mind and heart are not easily won over. So it has to be great performance. However there is a man who managed to quickly win over the hearts of men and women. His performance was perfected over several on screen careers. Spanning from getting in the ring with pro wrestlers to telling interns they are fired on cable TV. The current President of the United States of America is the biggest performer. Who else deserves such a title other than the most powerful man in the world. The guy knows how to woo a crowd. He has certain magnetism which draws people to him. This may be the secret behind his great empire. And what an empire it is. Hate him or love he knows his has a way to people’s hearts. By the end of his second term. The charmer will most probably get that far. There will be several online casino games based on him. All great performers have real money online casino games based on them or the characters they play visit www.casinous.com to see which online casinos you can play at. You may have doubted the man’s abilities as a performer during his time as a TV game host or at wrestling entertainment. But the American election must have convinced you. The whole nation fell in love him. Even though there is very little love. Really there isn’t. Mr. Trump fails to be politically correct even in his own party. Real money gaming is proving to be the next billion dollar opportunity. With the relaxation of the online gambling laws across the United States, online casinos can present massive opportunities for investors and entrepreneurs. Online casinos maplecasino.ca are able provide more effectively for the massive market. There is high demand for gambling services. This translates to a very large market which is attractive to entrepreneurs and investors. In most properly legislated regions online casinos are giving back to the community. These states are earning an estimated 32 billion dollars annually collectively as generated revenue. The governments are using the funds for developmental projects. Funds from online gambling are being channeled towards promoting responsible gambling initiatives. Juniper’s research shows that online betting using mobile devices will produce income valued at a hundred billion dollars. This revenue is a joint amount for worldwide industry by end of 2017. Remember that mobile casinos are actually on the rise. Most gamblers still prefer to gamble online using their PC. MGM National Harbor is fast becoming one of Maryland’s biggest revenue growth drivers. Since its opening the casino has already brought USD133,000 to the state. This is by December 2016. Pushing up the impressive year-on-year income to above 40%. This amount excludes the revenue from the newly opened casino. MGM’s casino managed to remain the one biggest driver to the state’s gaming revenue. This alone shows that the contribution that casinos, both online and offline, make to a state’s budget is remarkably important. The time has come for the world to embrace online casino gaming. The benefits of the pastime are numerous. These go beyond just getting tax from the casinos. The industry has created a lot of new jobs for people. Jobs that previously did not exist like live online casino dealers. The future cannot be stopped no matter how much we try and delay it. The overnight ratings are in for 10.1: The Pilot. The episode achieved an overnight viewing figure of 4.64m viewers, with a 24.8% audience share, and was the second most-watched show on BBC One for the evening. The final BARB ratings will be confirmed on Monday 24th April, and will include the time shift which will see a much larger rise in the final rating. 4.64m / 24.8% audience share. + What did you think of the episode? Rate / Discuss in the DWO Forums! Going into Series 10 was always going to be a bittersweet situation; there's the excitement of a brand new series, after what feels like an age away from our screens, coupled with the sadness - and reality - that Peter Capaldi will be leaving the show this year. Perhaps, what has made this a particularly bitter pill to swallow, is just how good Capaldi is in this opening episode. 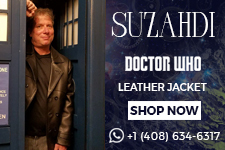 He is fully into his groove as The Doctor, and embodies the role with gusto, and you can't help reminding yourself after every little Doctor-y moment, that his days are numbered. Thankfully, we have new companion, Bill Potts (Pearl Mackie), to help distract us from the harsh reality of Capaldi's departure. 'The Pilot' takes Doctor Who back to its basics, and, much like 2005's 'Rose' was a companion-centric episode, Bill has a real chance to shine as she takes up the majority of the screen time in the episode. And just how good is Pearl Mackie as Bill?! She positively shines with energy, attitude, intelligence and...yes...that AMAZING hair! The lump in our throats from Clara's departure is very much still there, but hands-down, Bill Potts will win you over before the end titles roll. There's a heart-breaking scene set at Christmas that is played down wonderfully, allowing you to connect your own dots, but it really gets you in the feels, and Pearl plays it so, so well. Matt Lucas' Nardole is definitely warming to us and he is fast becoming a character that you're glad to have in moments when The Doctor seems a little too 'alien' to Bill's emotions. There's a rather lovely little scene towards the end of the episode that stands out in particular. The episode itself delivers in so many ways, and whilst it may not quite live up to the Series 10 opener, it sets up a new direction, a new companion and a new threat, fantastically. A typical device used by Steven Moffat is to take an everyday object and turn it into something sinister, and The Pilot is no exception. Without wanting to give too much away, there's a puddle that's...well....not *quite* a puddle, leading to some moments within the episode that will genuinely make you jump out of your seat. Oh...and taking a shower will never seem quite so appealing anymore. There's a neat little scene that almost mirror's Rose's descent into the basement in 'Rose', and whilst Bill is very different to Rose, you can't help feeling the connection here. Expect a very different reaction from Bill when she sees the interior of the TARDIS for the first time (rather frustratingly for The Doctor), but it's played out very well indeed, to comic effect. Those of you expecting an all-out Dalek-filled romp will be disappointed as their appearance is fleeting, but you do get a rather nice cameo from some Classic Series characters who have a certain association with them. The scene that featured in the BBC One companion reveal of 'Pearl Mackie as Bill' does indeed find its way into the episode, albeit an edited version to suit the pacing. What we are missing most from the episode is Murray Gold's amazing scores. Don't get us wrong, there is some new material here from Gold, mostly connected to Bill Potts, but the music isn't as anthemic as it used to be. For the record we absolutely adore Murray Gold's music for Doctor Who, and there's no denying we've been a little spoiled over the years with so many audible treasures, but the days when 'All The Strange, Strange Creatures' or 'I Am The Doctor' became set pieces that followed through the season, seem to be fading. There is a rousing snippet of the 12th Doctor's 'A Good Man?' theme, but it feels a little shoe-horned in, and what this episode is crying out for is something new and bold to push it above and beyond. Overall we loved the episode and you definitely feel like you've been on an adventure by the end of it. Things feel renewed and refreshed, which goes hand-in-hand with this show and The Pilot wonderfully, and rather aptly creates a new stepping-on point for anyone wanting to start their own journey into the Doctor Who series. 1) A TARDIS trip to Australia! 2) A jar of Sonic Screwdrivers! 3) A present in the wardrobe. 4) What is The Doctor guarding? +. 10.1: The Pilot airs This Saturday at 7:20pm on BBC One. An "Enormous Spoiler" Coming Up In End Of Episode Trailer! During last night's press screening of the Doctor Who Series 10 opening episode 'The Pilot', Steven Moffat teased an "enormous spoiler" in the trailer that precedes it. "This is just a public warning... some people hate spoilers and some people love spoilers; and everybody hates me whatever way they think about it. So this is my last attempt in this role to avoid hatred. At the end of the episode there will be yet another awesome trailer for Doctor Who. At the very end of the trailer there is, frankly, an enormous spoiler, a spoiler that may actually melt your brains. But I promise you, you'd be better off not knowing because - awesome though it will be here - it will be even more awesome in a few weeks' time. So we're gonna give you the option, in our frankly camp and ridiculous way. There will come up a warning and then there will be a countdown to the spoiler, and then there will be a warning to 'blink now'. If at that point you close your eyes and wait until you hear the cliffhanger noise, you will have a better experience in a few weeks’ time." So what could this spoiler be? 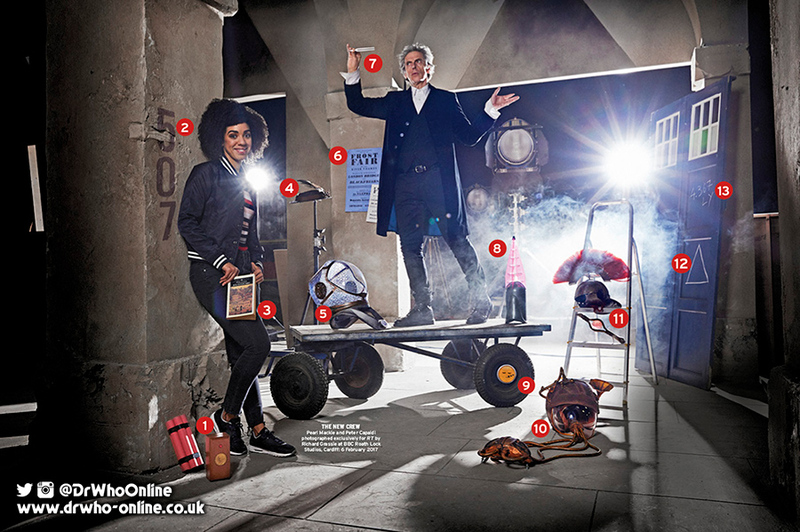 Let's cast our minds back to yesterday, when the Radio Times released an image featuring 13 clues from Series 10. One of the clues (No.3) was a book that Pearl Mackie was holding - a book that anyone who is familiar with the Penguin Classics will know as 'Northanger Abbey'. What a lot of people don't know is that Jane Austen (the author of the book) originally titled it 'Susan'. Based on the prominent placement in the image, as well as the brief shot of a photo of Susan in a recent clip from the episode, our money is on Susan being the big spoiler. We'd love to hear what you think the spoiler is. Do you agree with us? Do you have another theory? 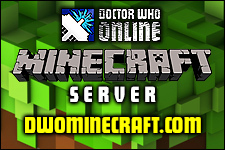 Let us know in the comments box below or in the DWO Forums, by clicking the 'Discuss' button. + Series 10 of Doctor Who airs from Saturday 15th April 2017. 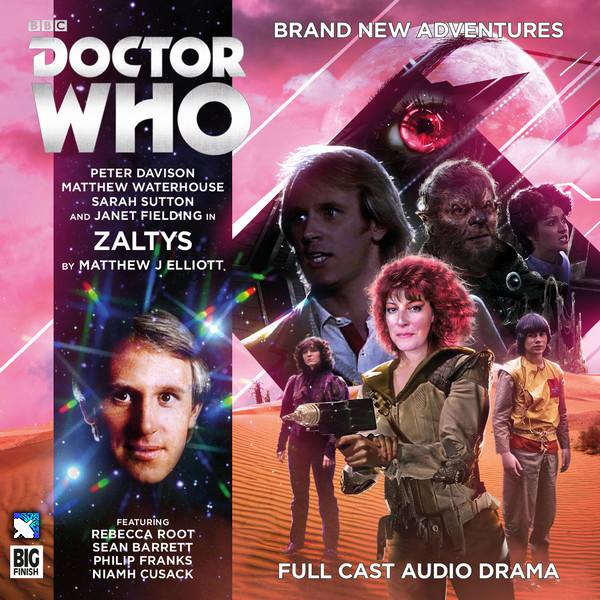 Meanwhile, deep below the planet’s surface, Adric learns the earth-shattering reason why the people of Zaltys disappeared... and why they were wise to do so. And Tegan is, quite literally, in the dark – enduring interrogation by the mysterious Clarimonde. Any friend of the Doctor’s is Clarimonde’s enemy... because theirs is a blood feud!" It wasn’t until reading Peter Davison's recently released autobiography that I realised he has now been doing Big Finish for over fifteen years. It puts into perspective the challenges faced by the writers of Big Finish to continually come up with new ideas while also staying true to the time the stories are set within the series original run. Although Davison's tenure with Big Finish is lengthy it wasn’t until 2014 when the original ‘Crowded Tardis’ team of the Doctor, Adric, Tegan and Nyssa were reunited once more. In 2017 they are now well into their stride and Zaltys writer Matthew J. Elliott has managed to recapture the sense of relationships that instantly transports you right back to that weekday tea time slot from the early eighties. All the tropes of that particular era are here and affectionately conveyed. The story opens with a protracted Tardis scene with our four protagonists. Big sister Tegan and little brother Adric are bickering away just as they always did. Tegan is still incessantly going on about getting back to Heathrow and actually goads Adric into showing off his so called superior maths skills and putting them into practice when programming a flight course to her desired destination. The chance to impress naturally appeals to Adrics constant desire to prove his worth to The Doctor, but needles s to say this goes disastrously wrong leading to the TARDIS crew disappearing one by one. And with that we are off into the heart of the story! This might be one of the most jam-packed stories Big Finish has ever produced, with so many disparate elements. We have fish people, a wolfman with psychic abilities, and grave robbers - to name a few. And all the while our TARDIS team are encountering these colourful characters, there's the threat of a huge space meteorite heading towards Zaltys that will mean the ultimate destruction of everyone. Of course Elliot’s real challenge is to serve all the main characters well, a feat the TV series failed at with regularity during this period. As well as getting all their characteristics spot on, Elliott manages to give them all a decent narrative strand too. Nyssa is paired with The Doctor as she frequently was in the original run; Adric forms an uneasy alliance with the custodians of Zaltys in a very similar vein to his questionable allegiances in Four To Doomsday and State Of Decay. Additionally Tegan gets plenty of time in a ventilation shaft. What could be more appropriate than that!! Special mention should go to Rebecca Roots' portrayal of Sable who brings a deadpan style of delivery that makes you really warm to the character and want to see her on more adventures. Phillip Franks and Niamh Cusack are also effective as the questionable villains of the story. Elliott also writes Davison's Fifth incarnation extremely well too. I always enjoy the breathless energy that he injects into every story but here we also get the acerbic wit that we know his portrayal was capable of but never truly had the opportunity to show consistently on TV. Perhaps only in Time Crash, so many years later, did we see what his potential for humour truly was. At certain points in the story you wonder how Elliott is going to tie all these storylines together, as it seems all the strands are running parallel and yet so separate, but manage it he does, and with aplomb. It is almost a shame we don’t get to spend more time with all the fascinating characters that he has created for our enjoyment. However the real gem of this story for me is some of the interaction between the regulars. There are a couple of standout scenes for me; at one point Tegan questions whether Adric was happier when it was just The Doctor and him onboard the TARDIS and when one thinks back to the opening scenes of The Keeper Of Traken and Logopolis it would be hard to argue that wasn’t the case. Additionally a scene towards the end between The Doctor and Adric which, knowing Adrics ultimate fate, is extremely emotive. Overall a great showcase for one of my favourite TARDIS teams; once again and a very ambitious story that revels in seemingly pulling together various storyline strands into a satisfying conclusion. "Everyone’s a little worried about St Helen’s Hospital. In many ways it is a miracle of the modern NHS. It has plenty to offer its patients. The problem is that a lot of them keep dying of natural causes in the night. And no-one can find the bodies. Also, Rhys Williams has come to visit his mother. Brenda’s had her hip done and is looking forward to a bit of rest and regular crumble. Rhys and his mam are in for a night they’ll never forget." 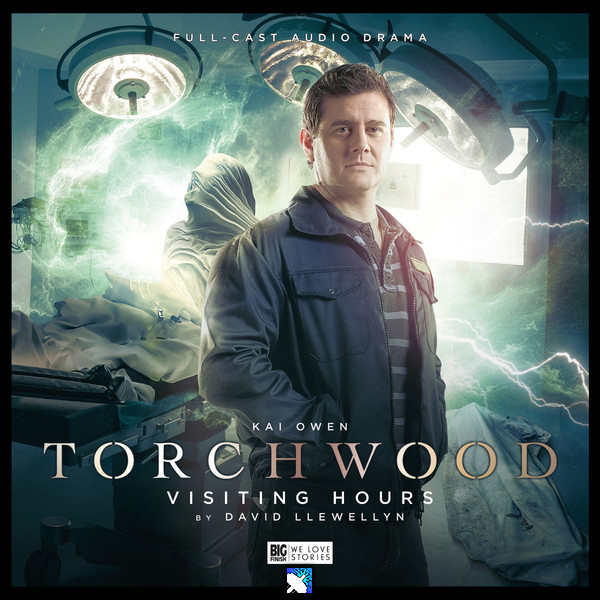 Last year the double dozen Torchwood stories that Big Finish realised were met with great acclaim, with some even stating this is the best form of the spin-off yet. It’s often the case that secondary characters get largely overshadowed in television series, even one of the calibre of Torchwood. The structure of these releases, focusing on individuals, allows for personalities and backgrounds to be effectively fleshed out. Although Rhys is more than a spare part throughout the TV episodes, it’s clear that other half Gwen wears the trousers in the relationship. Here, the attention is pointed at Rhys (played by Kai Owen) and he’s given an opportunity to shine. It would have been easy for writer David Llewellyn to have him acting the clown, blundering his way through proceedings, but after his brushes with previous alien incursions, Rhys has learnt quite a bit. Torchwood, like Doctor Who, seems to flourish in circumstances where the extra-terrestrial meets the mundane. For all its spaceships, aliens and megalomaniacs bent on invasion, the ‘brand’ (especially since its reboot) is very strongly grounded. It cleverly focuses on individuals and their everyday lives. Most of this tale is set within the walls of a Hospital. With Rhys visiting his mam, but it’s not long before things turn eerie. The brilliant Nerys Hughes returns as (the comparatively less fanged-up) Brenda from ‘Torchwood: Something Borrowed’. She portrays the older mother vibe perfectly. Nerys and Kai have a believable ‘’mam’ and son relationship. Essentially this story is about family, exploring how far people will go in protecting them. Ironically, stars of ITV2’s Plebs, Karl Theobald and Ryan Sampson, play foreboding henchmen, pursuing our heroes. Uniquely, they have strong motives for their actions over and above that of their ‘employers’ After the climax of last year’s series, which brought to an end the villainous committee’s escapades, mutterings of a similarly mysterious force suggests a running plot. The one element of the story that for me unfortunately let it down, was that the plot’s resolution didn’t do it’s lead up justice. It felt a bit like a sonic screwdriver solution, and would have really benefited from a little more time to establish. On the whole, this is an excellent release, which rattles along at pace. It expands the background of a much loved character, containing some heart-warming moments, against an eerie impending threat. The writers seem to be keen to push the boundaries and dynamics further at this point in it’s audio run. Next month’s release: ’The Dollhouse’ centres itself around the institute’s branch of female fighters in LA. Help James Moran's 'Blood Shed' Reach Its Kickstarter Goal! Awesome Writers, James Moran (Doctor Who, Torchwood, Cockney's Vs Zombies) & Cat Davies (Connie, KEEN-wah), have joined forces for a cool new Horror short about a man-eating shed, and they need YOUR help with their Kickstarter project! A dark and twisted laugh out loud comedy about a man’s love for his shed… that eats people. Brought to you by an established, award-winning team, prepare for the night of the living shed… Starring comedy icon Sally Phillips (Smack the Pony, Veep, Miranda, Green Wing, Bridget Jones) and award-winning actor Shaun Dooley (Gunpowder, Broadchurch, The Woman in Black, Misfits, The Awakening). The project is less than £2,000 short of their £10,000 target, with just a few days to go, so please give whatever you can to help fund this AWESOME film! Breakfast With The Doctor - Comic Relief Auction And Prize Draw! Ever wanted to have breakfast with The Doctor? Now you can! In fact, now you can have breakfast with 7 Doctors...all at once - and it's all in the name of Comic Relief! The Wolseley on Piccadilly will be hosting a landmark meal where, for the first time in the show's 54 year history, Peter Davison, Colin Baker, Sylvester McCoy, Paul McGann, David Tennant, Matt Smith and Peter Capaldi will meet to break bread and talk TARDIS. Here, inside its hallowed hall, the meal of meals will take place. An epic event, a world first, and a legendary opportunity to witness history in the making. To join them on this remarkable morning, bid now, the highest bidders will be invited to take their seats at the table to join the seven Doctors for what is already considered the most historic breakfast in the history of television. Can you imagine the talk? There are two ways to enter; 1) Enter a bid in the online auction, where the current bidding stands at £10,000, or 2) Enter a Prize Draw, where the tickets cost just £5. NEW Series 10 Promo Image, Trailer And Episode Title! The BBC have released a new iconic image for Series 10 of Doctor Who, and have confirmed a new trailer will air Tonight! The promo image features Bill Potts (Pearl Mackie), The Doctor (Peter Capaldi) and Nardole (Matt Lucas), escaping a burning city in the TARDIS. A new 60-scond trailer will air Tonight on BBC One at half-time, during the FA Cup Quarter final match between Chelsea and Manchester United. Finally, the title of Episode 1 of Series 10 has now been confirmed as 'The Pilot'. Back in November we reported on the fantastic news that Who Dares Publishing - the legendary 1980's Doctor Who publishing company, was back and kicking things off with a fantastic calendar, featuring the artwork of acclaimed Doctor Whoa artist, Andrew Skilleter. Now in February of 2017, we are thrilled to be among the first to reveal that Who Dares Publishing are releasing a new series of exclusive, limited edition, Doctor Who collectable art portfolios. 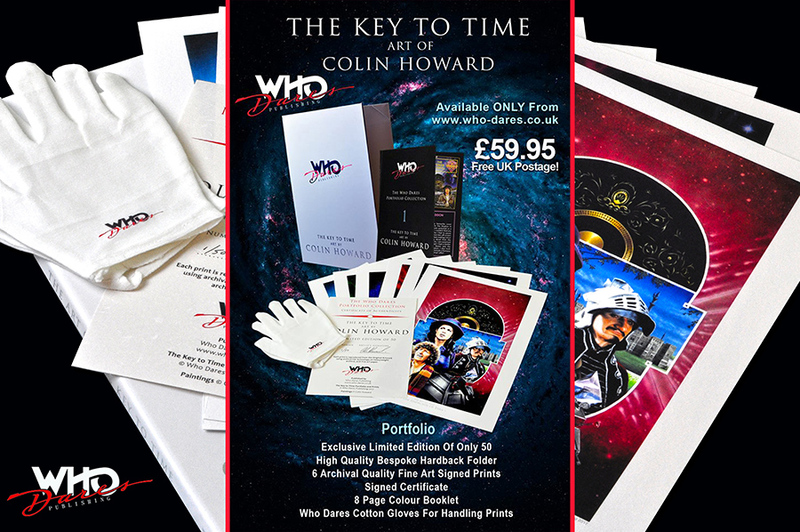 The first portfolio features the artwork of Colin Howard, and comprises of six prints featuring the artwork from The Key To Time Doctor Who VHS covers. There will be just 50 of these limited edition portfolios, all signed and numbered, and costing just £59.95! DWO were lucky enough to get our hands on one of the portfolios, and they are of an incredibly high quality. If you're anything like us, you'll remember seeing the videos in your local W.H. Smith's, Blockbuster Video or MVC, and the artwork really popped out. So what do you get in the portfolio? Well, it's a white hardback folio, that opens up to reveal a compartment holding all 6 of the prints. There's also an accompanying booklet with information on Colin Howard, as well as a certificate of authenticity, and, last but not least, some 'Who Dares' printed gloves to handle the artwork - a nice little touch! These prints are screaming out to be framed, and, if this portfolio is anything to be judged by, the future looks incredibly bright for Who Dares Publishing! + BUY 'The Key To Time Art By Colin Howard' Portfolio from Who Dares for £59.95. The BBC have aired a new trailer promoting Series 10 of Doctor Who. The trailer, which is going by the title 'A Time For Heroes' (along with the #TimeForHeroes hashtag), harks back to one of the first trailers when Doctor Who came back in 2005. It's from Bill's (Pearl Mackie) perspective and offers a glimpse at some of the monsters and villains we can expect in the tenth series. +. Series 10 of Doctor Who airs on 15th April 2017. 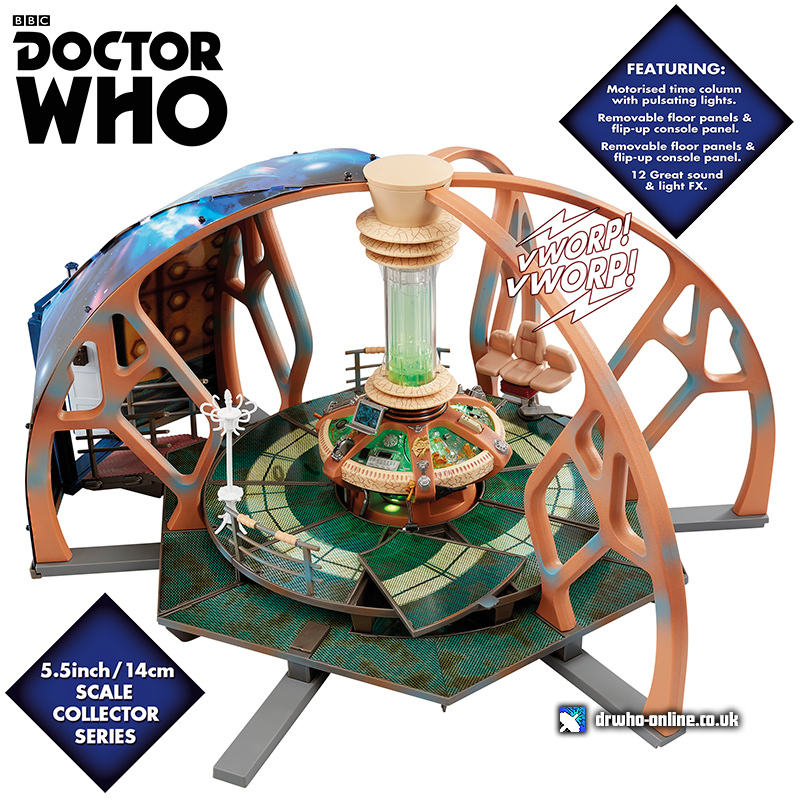 The Tenth Doctor's TARDIS Console Room Playset - OUT NOW! 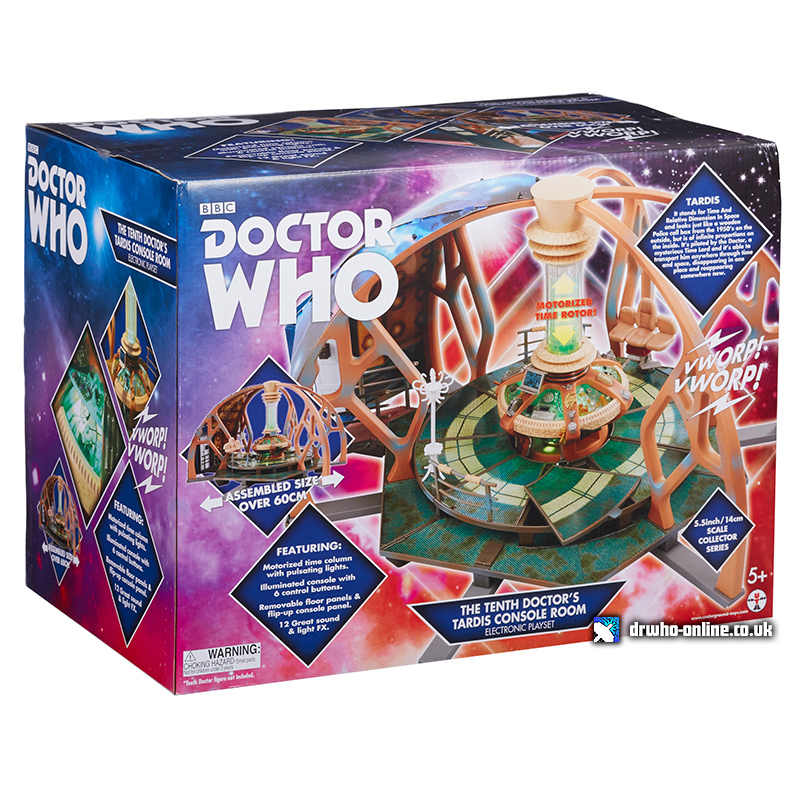 The Tenth Doctor's TARDIS Console Room Playset is now available to buy via the Character Options online store. Motorised time Column with pulsating lights. Illuminated console with 6 control buttons. Removable floor panels & flip up console panel. 12 great sound and light FX. + The Tenth Doctor's TARDIS Console Room is Out Now, priced £49.99. + ORDER this toys directly from Character Options! + Discuss all the Doctor Who Toy releases in the DWO Forums. Sydney Newman: Innovator, designer, director, and producer. In April it will be 100 years since Doctor Who's creator was born, but where exactly did the idea come from? How much of it came from him before Bunny Webber's famous memo which established the idea did the rounds? In 2013, the BBC aired An Adventure In Time and Space; a dramatic reconstruction of the early days of Doctor Who, and Sydney was played by the excellent Brian Cox. It was a great portrayal of the man, and other founding members such as Verity Lambert, Waris Hussein, and Mervyn Pinfield, and was well received in Doctor Who's 50th year. But in the very beginning it was touch-and-go for the real show, and Sydney's role was as an over-seer and advisor to Verity and her team in 1963. Looking back after all of this time, and understanding Sydney wasn't entirely happy with how the series started off until it became a success, its easy to forget his role. Him creating such a phenomenon was no surprise, although people would have thought it unlikely of a children's show. He had already changed drama in Britain, and people's perception of culture with theArmchair Theatre series he produced as head of drama at ABC, before he moved into the same role at the BBC in 1962. The series showed for the first time people on the fringes of society such as unmarried mothers, drug-addicts, and the homeless, and regional accents were used. Plays like No Trams To Lime Street, and Cathy Come Home showed the face of changing Britain as it looked towards the future which didn't look very bright. And the future is what Doctor Who was all about, although its original premise was to educate and teach children about history and science. One week an adventure would be set in the past, and the next it would be in the future, and that is where the ratings were at. Sydney had always love science-fiction, but the basic idea for Doctor Who had been with him for at least ten years before it made it onto the screen. 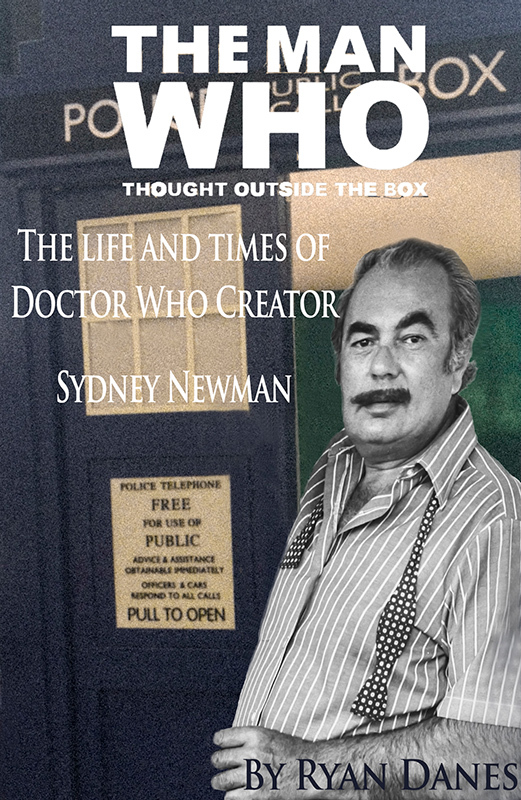 His biography The Man Who Thought Outside The Box: The Life And Times Of Doctor Who Creator Sydney Newman, reveals lots of information about the worlds best-loved science-fiction show, and the man who created it. It is a must for all Doctor Who fans. It is available to preorder now from digitalentropy@hotmail.com for £11.99 and will be released on April 22nd 2017. "The TARDIS has landed in a war zone. 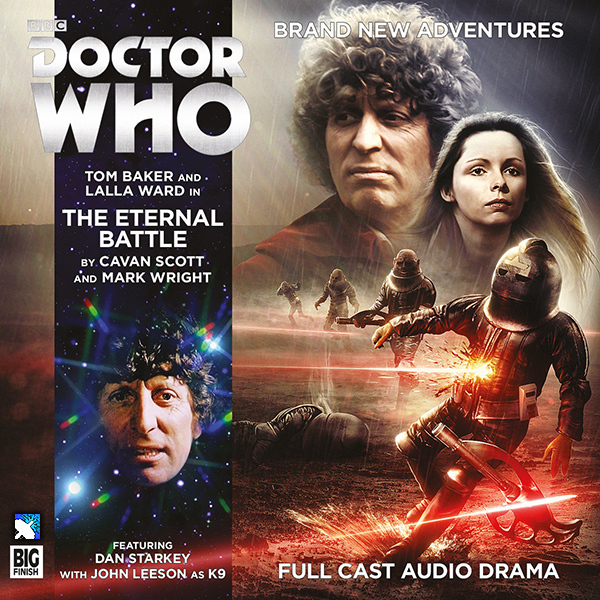 The Doctor, Romana and K9 find themselves traipsing through an inhospitable battlefield. Strange lights flicker in the sky, and stranger creatures lurk in the darkness. With the TARDIS missing and their luck running thin, the Doctor and his friends’ only hope of survival is to uncover the truth about what is happening on this planet. If they can discover the secret of the eternal battle they might just survive… but it might just mean the end of them all." One of the aspects I have disliked intensely about the series since its return is its treatment of classic villains. The Cybermen have effectively become that “pathetic bunch of tin soldiers” that the Fourth Doctor chastised them about being so long, long ago. I was not particularly enamoured on the re-design of the Silurians or their overall return, either. Even the Daleks had a wobble in Victory Of The Daleks but the least said about that the better. I have a sense of trepidation about the Ice Warriors returning in the new series too as I felt the one monster threat in Cold Blood served them well but once they are an army? Who knows! And then there are the Sontarans. One of my favourite villains from the classic series reduced to comedy foils time after time again. I didn’t mind Strax the first time around but the law of diminishing returns meant that the comedy wore thin and it just made me yearn for that particular race to return to their strangely honourable and war mongering selves of old. So in all honesty going into this one my hopes weren’t high. Could these be the Sontarans that waged a brutal war with the Rutans or will they reflect the more comedic variety of recent times? Well the honest answer is neither really, here they are something a little different. Writers Mark Wright and Cavan Scott have been very clever in this story. In the midst of a very bleak environment, combatting an endless and futile war, they manage to humanise the Sontarans without weakening them from the original approach to this race in the seventies. Big Finish always manage to revisit a classic foe and put a different spin on them. The narrative tactic they adopt is to split up our TARDIS team, on this occasion the Fourth Doctor, Romana II and K-9, and pair them with two different Sontaran warriors who both are unusually open in reflecting on their respective roles in the ongoing battles. Which brings us to Dan Starkey. Dan of course is famous for playing the aforementioned Strax, the Paternoster Gang member who provides nearly all the light relief in the stories he has featured in. Here, with the exception of some vocal work by John Banks, Dan provides nearly all the Sontaran voices and in some scenes is actually talking to himself! Quite the feat! Between them they manage to inject an impressive sense of pathos as we uncover what the Sontaran sense of honour truly means to them and it doesn’t necessarily translate to dying in battle as recent serials would have us believe. This race does not fear their ultimate end, but neither are they actively seeking it out. And what of the regulars? Well you would never expect nor receive less than a top notch performance from Lalla Ward and John Leeson and their on screen chemistry is easily replicated once again here. Tom Baker's’ love for doing these audios again shines through and he seems to be having enormous fun throughout, without going overboard. 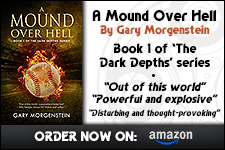 He gets the tone just right and is a shining beacon in what is, at times, a very bleak tale. I am a big fan of what Jamie Robertson has done with the score of this one. I adore the music of Season 18, and here he recaptures some of those synth infused moments perfectly. Interestingly The Beast of Kravenos was also set supposedly in Season 18 but the same approach to the music would have felt distinctly out of place in the Victorian setting. Here it is applied with careful consideration to enhance the right moments. Tales with a zombie theme have been done to death (ridiculously obvious gag) but here they are given an interesting spin. But although key to the story, as is the futility of war, these are merely the backdrop for the characterisation and interaction between the Sontarans, the humans (who are perhaps underserved within the relatively short running time) and the TARDIS team. So essentially a character piece on a long established race, but one which has managed to make it so that, arguably the most one-dimensional of all the Doctor Who adversaries, can now be appreciated through new ears.